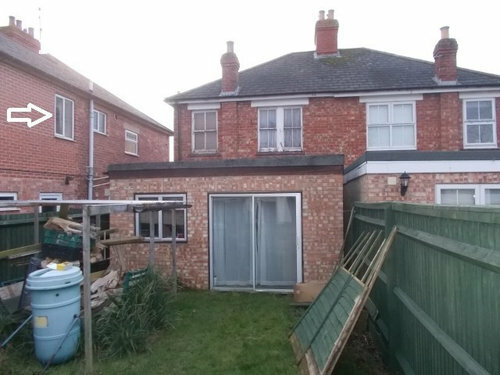 I'm looking into having a first floor extension above the existing kitchen extension, with a pitched or flat roof on it. The sun rises behind the position where I'm standing taking the photo. I'd like to know am I going to have any problems getting planning permission for this extension, right to light possible issue with next doors first floor back bedroom. The other neighbor had a large extension put on their property some years ago. Their stair landing window, white arrow would outlook onto the proposed extension wall. Oh,the ground floor footings were put in strong enough to support an upper story. If your ground floor extension was three metres or smaller from the original rear wall you should be able to add a first floor under permitted development. Is my garden design just naff?